o, my journey begins as Poet in Residence of Fair Field, a site responsive, multi-disciplinary performance project that reinvents a medieval poem for a modern audience. A world of inequality, binge drinking and sin, re-moulded to reflect the unsettling inequalities in the world today. 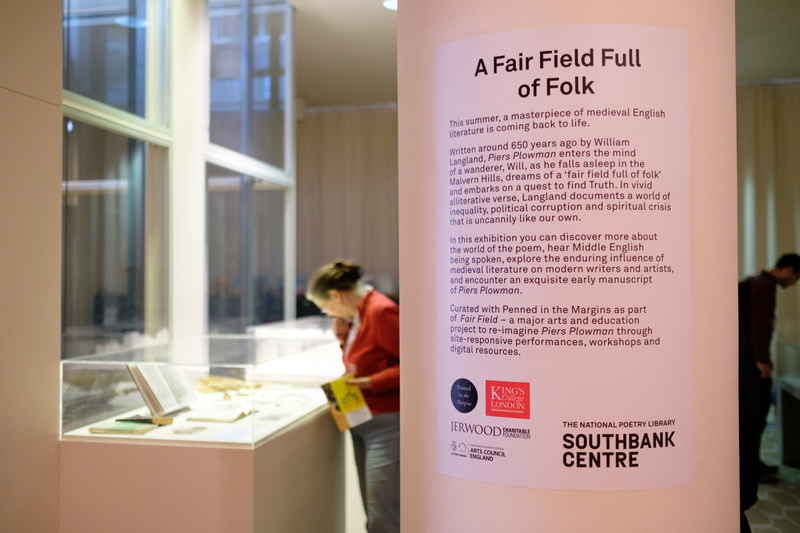 I took my first step into the world of Piers Plowman at A Fair Field Full of Folk, an exhibition which opened on 11th of May at the National Poetry Library. The Library is on Level Five of the Southbank Centre and is one of those places that make me feel calm as soon as I set foot in the door. This is where poetry lives; poetry books are lined up on the shelves quietly napping, as they wait for someone to pick them off the shelf. This peaceful pocket of poetry in the middle of busy London is the perfect setting for an exhibition about the timeless value of poetry, and the role of the poet in socially turbulent times. The exhibition presents medieval poetry through a contemporary lens, with new artistic commissions by Larry Achiampong and Nicola Jedrzejczak. Larry’s video artwork, ‘Sunday Best’, reflects the spiritual and theological side of Piers Plowman, revealing the intensity of devotional prayer. 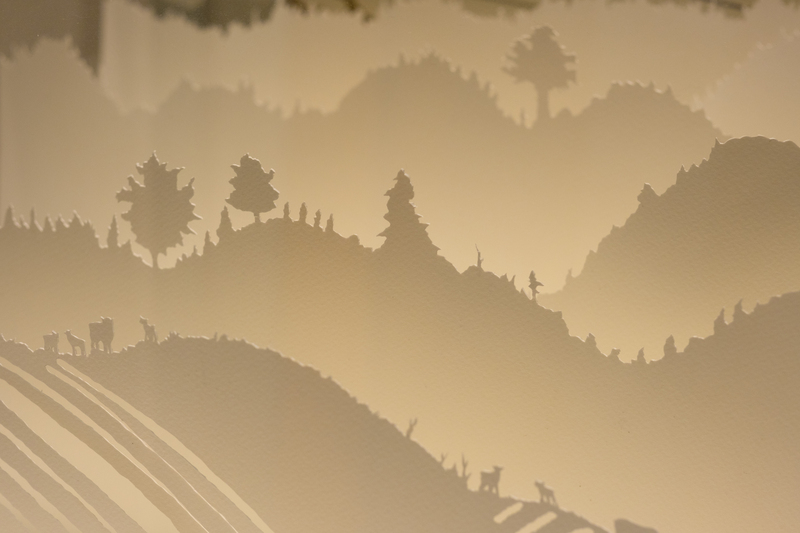 Nicola’s paper sculpture visualises Langland’s society, creating a connection between the past and the present as we are able to peer in on this world and imagine the sounds of people shouting in the streets of medieval London (or Ledbury), horses neighing, church bells ringing; this is where Piers Plowman comes to life. 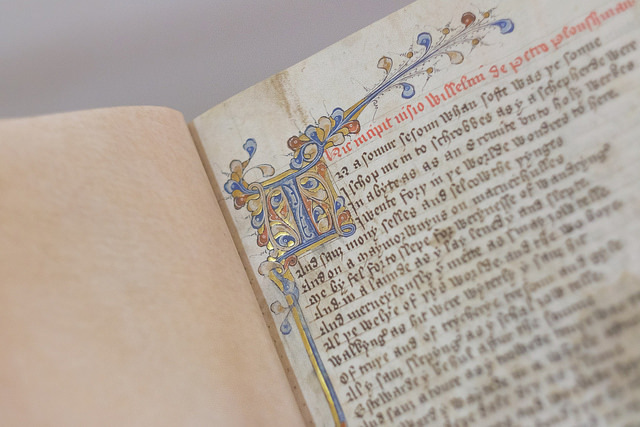 At the heart of the exhibition lies a manuscript of Piers Plowman (C-text) dating from 1400. Seeing the manuscript reminded me that William Langland was actually a real person, as strange as that might sound.  When a work of literature becomes iconised, the author adopts a fictional identity. I often think of Shakespeare as a fictional character, because our understanding of him comes through texts written about him rather than by his actual presence in the world. I think of William Langland in a similar way, but when I saw the manuscript with its beautiful typography I felt a connection with the author, as a wanderer, an outsider, a poet, observing society and trying to make sense of the world through the written word. ‘A Fair Feld Ful of Folk’ by Nicola Jedrzejczak. Photograph: Harpreet Kalsi. Langland’s reoccurring outcry at the social injustice which many ordinary people face in his society, makes me think he would feel similarly outraged seeing people living off food banks, and trying to survive on zero hour contracts. For a world that has forgotten to care for one another, Langland’s remedy is to plough the land, a metaphor for the necessity of coming together to share a mutual obligation to care for the earth. At a time of terrorism, extremist politics, and an ever increasing divide between the rich and the poor, we need the words of Piers Plowman to remind us of the importance of empathy. This allegorical poem can give us a better understanding of the problems that exist in today´s society, and I hope you will join me, over the course of my Residency, in discovering why a contemporary re-imagining of Piers Plowman is necessary now more than ever. Stay tuned for more critical and creative writing on Fair Field, and follow me @sophiefenella for Piers Plowman-related micro-poems and more. Sophie Fenella is Poet in Residence for Fair Field in a collaboration between Penned in the Margins and The Poetry School.